Education Game News. The Starry Night Puzzle. P42 Release date 05.08.2016 year. On focus a new Planeta 42 free knowledge level game from the Interactive Creаtivity Atelier - educational tools, about drawing and paintings. 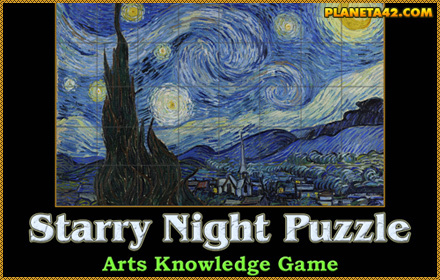 "The Starry Night" is a small square rotaitng puzzle to sort the famous art divided in 40 pieces. New free online flash game.